An 86-year-old lady returns to work today after fracturing three ribs and removing several cancerous nodules from her left lung. She isn't a victim of social or economic injustice though. Ruth Ginsburg is a Justice on the United States Supreme Court and she is arguably holding the balance in a fragile legal system. So there's a lot riding on her ability to perform. In fact, this was her first notably absence in 25 years. President Trump has already managed to appoint two conservative Justices to America's highest court. So there are now 5 conservative and 4 liberal judges serving. Should Ginsburg retire now or otherwise be unable to continue her work, it would give Trump the opportunity to sway the Supreme court to a 6 - 3 majority. Something that could very well shape US laws and policy for decades to come. 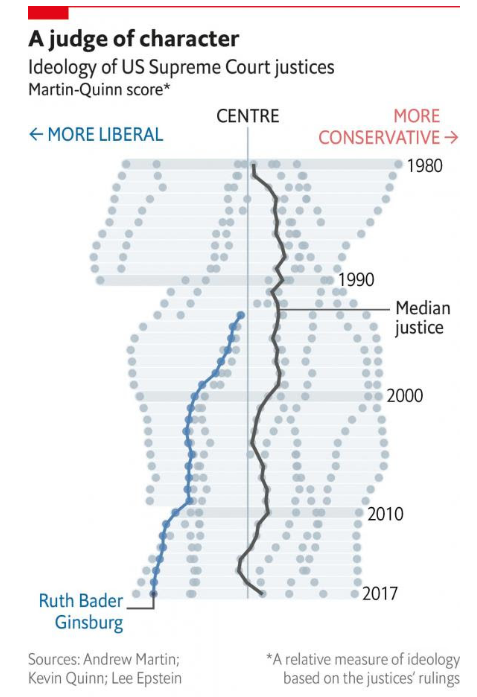 In this graph from The Economist, we can see conservatives enjoying a slight judicial bias since 1980. We would like to wish Ruth the best of success, may she live a very long and healthy life! Sixteen states have already formed a coalition to ask the courts to block the President from proceeding and this battle could play out for some time to come. However, as the amount of money they're squabbling over is relatively small, this partisan bickering probably won't have much impact on the markets, short of any major breakthroughs or escalation. Markets were up earlier during the Asian session but by now they are decidedly down. Brexit concerns, US-China Trade, and an apparent European slowdown are taking their toll, despite pledges from the central banks to prop them up. The United States will come back from their long weekend today so the first few minutes after Wall Street rings the opening bell will be fairly significant. The shiny yellow metal has reached fresh highs this morning and is now at levels not seen since last April. Please note: All data, figures & graphs are valid as of February 19th. All trading carries risk. Only risk capital you can afford to lose.